Cap up to 12 cm, hemispherical, later convex to flat-convex, velvety or smooth, pale brown to dark brown, sometimes dark brick coloured, darkening when bruised (var. luridiformis) or bright yellow, durty yellow to yellow orange (var. discolor), with darker rusty or brownish spots, blueing when bruised. Stipe club-shaped, sometimes bulbous or tapering towards the base, whitish, cream or yellowish, covered with dense, large, red granules or (var. luridiformis), or pale yellow to yellow with scattered fine, pale orange, orange or rusty granules, reddish vinaceous in the base (var. discolor), stipe surface blueing when bruised. Flesh lemon or pale yellow, blueing when exposed to air. Tubes lemon yellow, blueing when bruised. Pores red or orange to yellow at the cap margin, blueing when bruised. Smell not distinctive. Taste slightly acid. 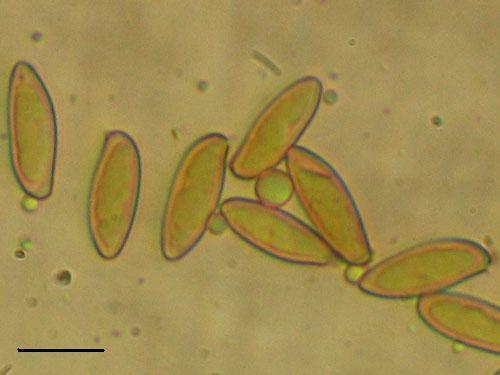 Spores 12–18.5 × 4–6.5 μm, ratio 2.2–3.6. Pileipellis (the cap cuticle) a trichodermium of interwoven septate hyphae of cylindrical, finely incrusted cells. Chemical reactions: hyphae of the flesh in the stipe base inamyloid with Melzer’s solution. Habitat. Coniferous, mixed and broadleaf forests, mycorrhizal with spruce (Picea) or beech (Fagus). Similarity. 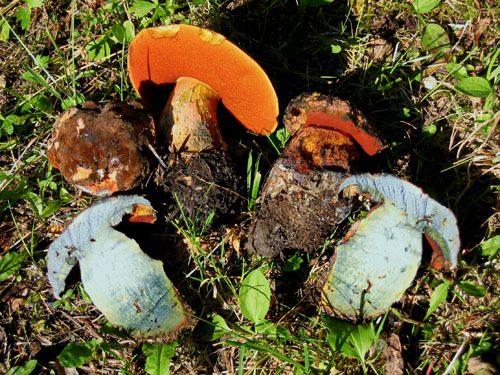 Compare with Boletus queletii. Habitat. Sheltered broadleaf forests, mycorrhizal with oaks (Quercus). Distribution. In Europe uncommon, more often encountered in south. Similarity. 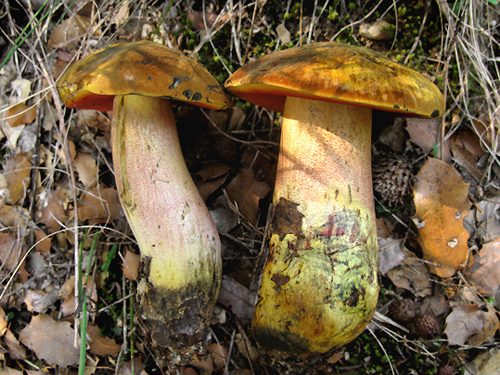 Compare with Boletus pseudosulphureus, which has yellow (not orange or orange red pores). 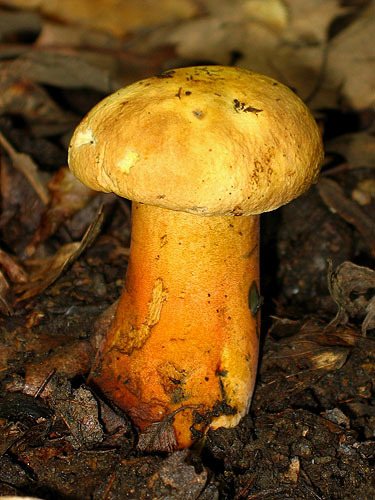 Boletus immutatus is very similar to B. luridiformis var. luridiformis, but has not blueing flesh. 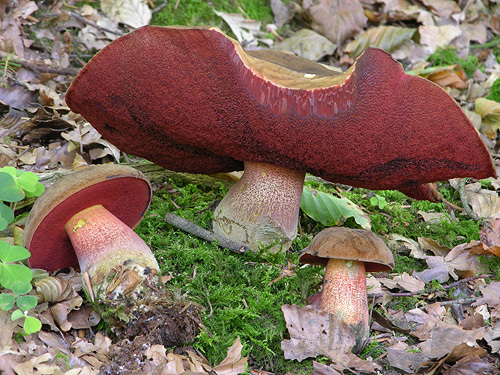 Boletus queletii is also somewhat similar, but differs clearly by the beetroot coloured flesh in the stipe base as well by its spores with different length/width ratio. Note. Some recent autorities do not recognize var. discolor, reducing it to mere synonym of B. luridiformis on the base of unpublished molecular studies. 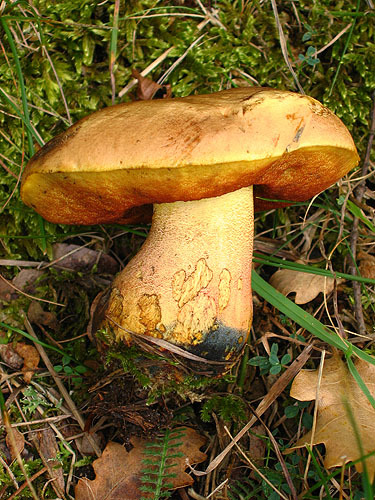 It is clear that the entity in question is very close and somewhat intermediate between Boletus luridiformis and B. pseudosulphureus. However, I do feel that its distinct features may merit recognition at variety level, at least until comprehensive published study is available for this confusing group. 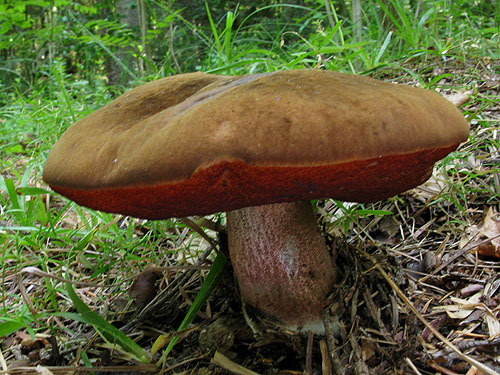 Boletus luridiformis was long time known under the name Boletus erythropus, but due to misfortunate confusion in the past it will have to be abandoned in favor of Boletus luridiformis. Dermek, A, Kuthan, J. & Singer, R. 1976. 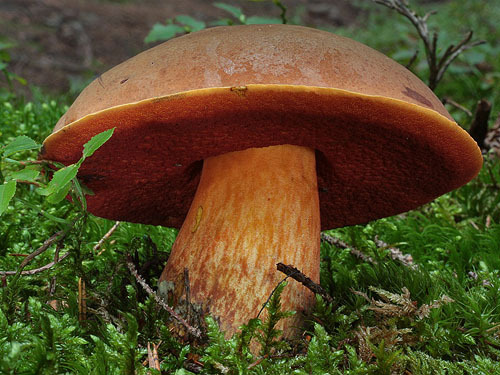 An interesting subspecies of Boletus erythropus (Fr. ex Fr.) Krombh. – Česká Mykologie 30: 1–2.